This version of the U.S. Armed Forces Survival Manual, edited by John Boswell, goes back three decades. It could save your life in one of those very rare moments. All you ever wanted to know about surviving in a hostile environment is found here. Many subjects are covered but a favorite is food; how to find it and cook it. Food is everywhere: growing at your feet, buzzing around your ears, slithering under rocks. The secret is knowing what to eat and how to prepare it. After reading the Survival Manual, you will know that insects such as “large grubs, termites and ants…are best fried or roasted,” and you should never eat the entrails or eggs of tropical fish. If your future plans include a visit to a cold climate, chapter nine can be of help in case you become stranded in the hinterlands. Topics include: direction finding, first aid, shelters, keeping warm, and finding nourishment in a part of the world seemingly devoid of anything but ice and snow. Seal blubber, for example, has several valuable uses. Once you get a fire started, “one square foot of seal blubber will burn for several hours.” Or if you happen to have a tin can and some seal blubber, a fairly good rubber stove can be made. After the fire has gone out you can feast on the remains since the burned blubber cinders can be eaten safely. Illustrated by Ray Kania. 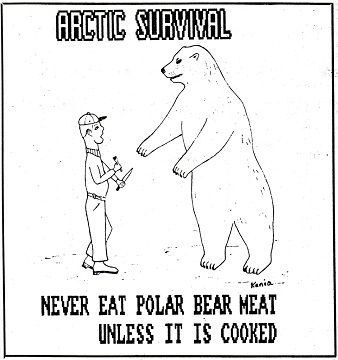 Never eat polar bear unless it is cooked. Scurvy can be prevented by eating scurvy grass since it contains large quantities of vitamin C.
A few items on sea and coastal survival could be valuable if ship-wrecked. First, be careful around the sea cumber. While it can be eaten smoked, pickled or cooked, some species have the unpleasant habit of expelling their internal organs when disturbed. These organs are quickly “regenerated” but the discharged fluids are a danger to your eyes. To obtain on a life raft, tie a piece of bright metal and drag it behind the raft. Birds will be attracted to within shooting distance . Avoid shooting a hole in your life raft, the manual advises. There are unique dangers confronting the unwary in the tropics, with consequences too unpleasant too dwell on. An example is the green coconut, which can supply milk that is nourishing in small amounts. Too much, however, will leave a lasting impression since the milk is a “violent laxative”. Persons caught in the wilds of Southeast Asia can utilize the ground-up seed pods of the dirris plant to catch fish. Block off a section of the water and throw the powder in. Wait a few minutes and “distressed” fish will begin popping up, ready for harvesting. The instructions add that if you have a hand grenade on you, toss it in and the yield will be greater. Did you ever have a problem crossing a piranah-infested waterway in South America? Try this method. ‘Throw the bleeding carcass of an animal into the stream and then cross at a safe distance upstream”. Back home an important survival subject is pine bark. Pine trees are familiar to most Floridians. What they might not know is the inner bark next to the trunk is rich in vitamin C. But the outer bark, which contains tannin, should be discarded. Pine bark can be eaten “fresh, dried, or cooked”. It can even be ground into flour. Some high-fiber breads in the supermarket contain wood (cellulose) from plants and trees. It’s reassuring to know that a person need not go hungry if lost in Florida’s forests. On the subject of Florida, remember “a hatchet blow between the eyes will kill a gator instantly.” Or not, if you don’t swing the weapon hard enough. You just might make him mad. 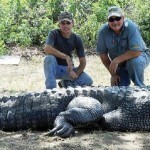 Of course you will have to give the authorities a good reason for your actions since gators are a protected species in our state. Click on image. Throughout the manual reference is made to the many uses a parachute and its shroud lines have in a survival situation. The chute can be used as a shelter, a smokehouse, or hammock, to name a few, while the lines can become fishing lines, nets, snowshoes, and much more. But, you may ask, how can you be sure the food you eat is safe? The answer is the edibility test. In simple terms you taste a little of the food. If it stings or tastes bad, spit it out. (There is a lot of edible food that would meet that criteria). If it tastes okay, swallow a small amount and wait for the results. Within an hour, if you aren’t having some unpleasant experience (hallucinating or retching perhaps? ), the food is safe to eat.